Detergents, their environment concerns and the regulations to control them have evolved side by side in the developed world. Detergents were developed during the Second World War. They became popular in the late 1950s and the first regulation to control their environmental impact was enacted in 1961 in Germany. So what's there in detergents that harms the environment? Detergents are not easily biodegradable; more so the detergents of the 1950s. Their use led to high levels of foams in some European rivers and this triggered the first set of regulations in Europe to control the types of surfactants (or surface active agents) used in the detergents. This regulation pushed the detergent industry to replace the poorly biodegradable complex-chain surfactants with linear-chain surfactants. Then came the phosphates. Phosphates are used in detergents as builders to soften the water so that less surfactants are required for doing the cleaning. But phosphates also cause eutrophication in waterbodies (nutrient enrichment promoting excessive aquatic plant growth whose decomposition later reduces the dissoved oxygen level in the waterbodies necessary for the survival of fish and other aquatic organisms). The eutrophication of the Great Lakes in the us and Canada in the 1970s, pressurised governments into introducing regulations on phosphate content in detergents. The us and Canada signed the Great Lakes Water Quality Agreement (glwqa) in 1972.
glwqa built in specific schedules for control and reduction of phosphorous loading. It identified municipal sewage as the main source of phosphorous. It found most of the phosphorous content came from detergents and human waste. Among the secondary sources were industrial wastes and agricultural runoff, including fertilisers and animal wastes. The primary recommendation was to reduce phosphorous content in detergents and thereby reduce the total quantities of phosphorous based detergents discharged into the Great Lakes system. glwqa agreed to reduce phosphorous to 2.2 per cent of detergent weight or phosphate compounds to 5 per cent by weight. Under a November 1987 amendment, this was cut to 0.5 per cent. By the 1990s, phosphate was totally eliminated in some us states. The industry tried to challenge this legislation in court over several years but could not overturn it. Several other countries followed this path (see table : Global controls). In recent years, regulation of detergent industry has moved towards regulating the toxicity of various constituents of detergents. In this regard, the 2004 European Detergent Regulation Number 48/2004 is the most comprehensive. This regulation introduced the concept of ultimate biodegradability of surfactants, which is achieved when surfactants are broken down by microorganisms in the presence of oxygen, resulting in the formation of carbon dioxide, water and mineral salts. It also fixed limits and emphasised potential toxicity of persistent metabolites from detergents. The regulation forced the detergent industry to disclose information about the various constituents of its products and label the recommended dose required for cleaning. For instance, surfactants, bleaching agents (both oxygen and chlorine based), zeolites, enzymes, disinfectants, optical brighteners, perfumes, preservative agents and other allergic fragrances should be listed. Faced with tough regulations and consumer pressure, European detergent manufacturers under the banner of "Code of Good Environmental Practice" presented in 1998, a framework for a self-imposed obligation aimed at achieving a saving of five per cent of energy per wash; a reduction of 10 per cent of detergents per capita; 10 per cent packaging and 10 per cent reduction in poorly degradable organic ingredients per capita by 2002. As a consequence, in the eu consumption levels of detergents have decreased from 10 kg per capita per year in 1996 to 9.16 kg in 2001. This means the per capita consumption per wash decreased by almost 30 grammes over the same period. 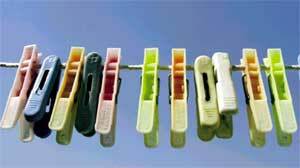 So regulations have worked in reducing the environmental impact of detergents in the developed countries. Why hasn't India thought of similar regulations?